Party Harder With LifeDance 2017, Three Stages Are up! I can still remember the very first LifeDance in Cebu, It was Cebu Bloggers Society that helped the core-organizers in spreading the news online while some of the Social Media Influencers did their part also via Facebook, Twitter and Instagram. This year, i'm very much excited as the Country's biggest outdoor party, LifeDance 2017 will bring up 3 stages : Utopia (main stage), Eden (underground music stage), and Solaris (indie bands stage) – headlined by sought-after international and local artists to create an overwhelming music experience. What's more interesting? This party is presented by the country's leading wireless services provider, Smart Communications - for sure, there will be surprises for party goers!!! LifeDance 2017 Map - Huge Map! International artists CARNAGE, LOOKAS, and DJ BL3ND will be gracing the stages, along with local sensations: Up Darma Down, Patty Tiu, Ace Ramos, Nix Dam P, Mecha, John Odin, Manolet Dario, and others who were carefully selected to create an atmosphere of hype and harmony for every raver that will be setting foot on the LifeDance festival grounds. And what is a party without drinks and foods? 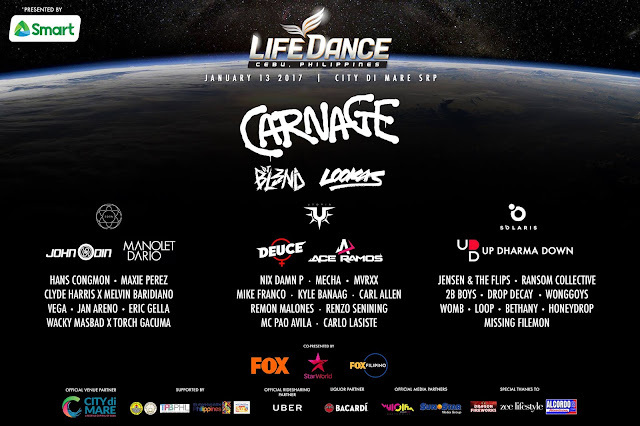 Good thing, the grand fanfare that is LifeDance will also highlight the different flavors and cuisine from various local food kitchens to make this a cultural and gastronomic journey for all visitors. It will be a true full-scale festival for everyone –from families to young adults, from the different corners of the world. LifeDance 2017 will be stretching its reach to the other regions with ticket outlets in different cities all over the country. Sinulog Packages with lodging and tickets to the event will be available for the convenience of those coming from out of town. 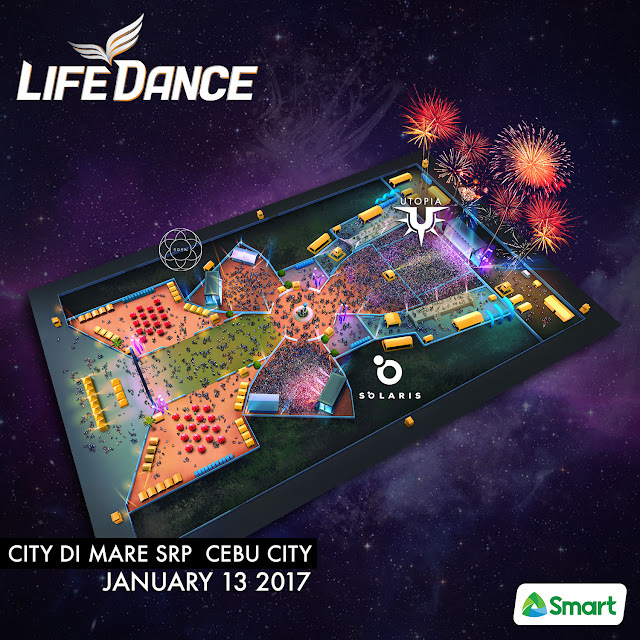 Endorsed by the DOT, LifeDance positions itself, as it has always been, as a tourist destination in Cebu for the Philippines.